We love to help churches of all shapes and sizes. We’re worked with tiny chapels needing small pews and with huge auditoriums with special architectural challenges. In other churches, we’ve accommodated special and unique needs for church furniture that other church furniture companies couldn’t or wouldn’t meet. If your church has unique church furniture needs, we can help. For instance, these short church pews shown at right are and example of work Born Again Pews has done that’s outside of the norm. 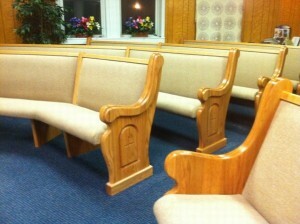 These church pews for a small chapel in a nursing home are made to serve their small membership. The chapel is a small room that’s squeezed into the nursing home to give residents a space for worship and prayer during their stay but isn’t a standard size or shape. 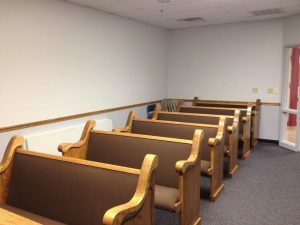 We made the church pews to fit comfortably in this space as well as to meet the unique needs of a nursing home, with space for mobility equipment like wheelchairs and walkers. The arm rests on these church pews are also at a great height for patients that need to hold on for stability to sit and stand. They’re made with the same high quality materials as our full-size church pews, so residents can depend on them to hold their weight without hesitation. These church pews show at left are sectioned and actually curve around the space. In this church, the sanctuary isn’t a square like most church buildings: it’s a half circle shape. We built these specialty church pews that curve with the room to use the space in the sanctuary best and to highlight its unique features. 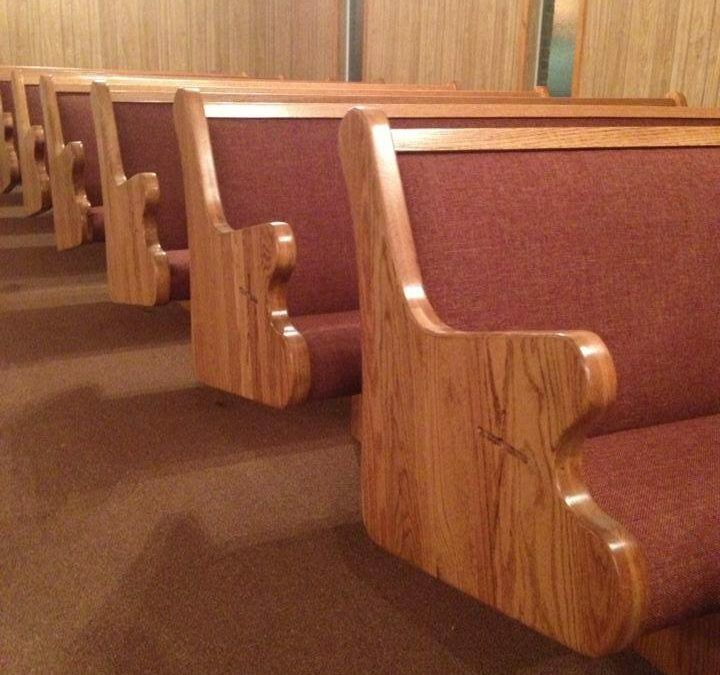 These church pews were made with the same techniques as our standard church pews, but with a few additional specialty woodworking techniques to build them to suit the space. 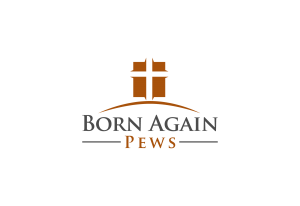 If you have special needs in your church because of unique problems, get a free quote from us today. We don’t back down from an interesting challenge like these!